Morocco will complete many of the plans in its 2026 World Cup bid even if they do not host the finals. The Moroccan bid is up against a joint one from USA, Mexico and Canada, with Fifa's members voting on 13 June. "We are interested in one thing - winning, but even if we don't win and we lose with fair play and that will be fine. "At the end of the day we will have given our best, we will have showcased what Morocco is about." Among the Moroccan infrastructure plans are the modernization and building of motorways, new high speed trains and an increase in airport capacity. The north African nation will also use 14 stadia for the tournament, five of which will be the renovation of existing structures and the building of nine new ones. Six of the new stadia will be 'modular' meaning the capacity can be reduced after the tournament. 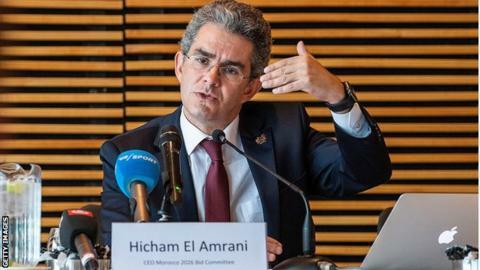 El Amrani said he is not concerned about whether African nations will vote for Morocco's bid. While nations like Algeria, Kenya and The Gambia have publicly given their backing to the plan, the South African government has said it does not support the bid. The political stance means that the South Africa Football Association has been forced to backtrack on their initial stance of backing the bid and insist no decision has been made yet on who to vote for. "Even if Africa has always acted in unity, unity does not mean 100% of all the member associations, this is part of the democratic process," he said. "Nobody is forced to vote Morocco if he believes that it doesn't serve the country or the country's football interest. "That doesn't mean that we don't have the vast majority of the African continent. Same thing within Europe, within Asia, where we have some countries supporting us, others not." He also dismissed the fact that some Fifa officials returned to the country for a second visit after the task force's initial inspection in April. "They simply needed more time, because time was always very limited. They needed to have some clarification related to stadiums and accommodation," he added. "The task force didn't come back, but some members of the administration of Fifa came back to seek some additional information that we could not put in the bid book, because they were not allowing us to put it in the bid book. "It was simply that clarification process that took place and everything went pretty well - in terms of, everything that was requested was provided accordingly." The next stage in the process is when the council receives the all-important reports from the task force. These assessments are expected to be published on May 29, which is when Morocco will learn if it will be on the ballot two weeks later. Meanwhile Morocco has asked Fifa to exclude four United States-governed territories from the vote on 13 June. Football's world governing body has not yet responded to the request that American Samoa, Guam, Puerto Rico and US Virgin Islands should be barred from voting.